HUBER HEIGHTS – What do the numbers 8 million, 500, 25, and five have in common? They are all milestone numbers for the 25th annual adidas Warrior Classic, and the Warrior Soccer Club. When first conceptualized three decades ago, tournament co-director Carol Maas said that about 50-60 teams were expected and 162 participated in the event. “They came from all over,” she said. 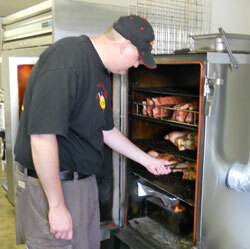 Mark Peebles checks the smoker in his Englewood restaurant. The adidas Warrior Soccer Classic soccer tournament, one of the largest youth soccer tournaments in the United States, will see a new food vendor in 2010. Oink-A-Doodle-Moo, a bar-b-que restaurant in Englewood is testing the waters so to speak, and will be at Thomas Cloud Park in Huber Heights, near Dayton, Ohio, for the event on Memorial Day Weekend. This is the second youth soccer tournament that Oink-A-Doodle-Moo will be at tempting tourney attendees with items from is savory menu. And if Peebles has his way, the passion emanating from Carol Maas, Director of the adidas Warrior Soccer Classic, and Gerard McLean of TourneyCentral will lead to other forays at youth soccer tournaments in the Dayton, Ohio area. “I didn’t grow up playing soccer, but when I see Gerard and Carol and see their passion, it gets you excited to be associated with something like this,” Peebles said. Plus, being at an event where participants and attendees come from literally all over the USA is beneficial for business. “We are gaining exposure in the local area, but because we have a franchise plan set up we are able to possibly recruit people from other cities as well,” Peebles said. Oink-A-Doodle-Moo conservatively estimates it will sell in excess of 200 pounds of meat, and go through a dozen or more gallons of sauce.